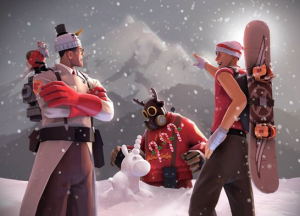 The Team Fortress 2 annual Christmas event, Smissmas is now live, bringing new cosmetics, taunts, and festivizer for weapons. Here is the list of all the things that are added in this update. We’re shipping 17 new community cosmetics in the limited-time keyless Winter 2016 Cosmetic Case. Plus, The Festivizer can now be found as a bonus drop when opening the Winter 2016 Cosmetic Case. Two new community taunts—The Scotsmann’s Stagger and The Didgeridrongo—and one new Valve taunt, The Table Tantrum, are now available in the Mann Co. Store. At the end of a Casual match, players will now be automatically formed into a new match with the same players and teams. You’ll also get to vote on which map the new match will take place on. We’re introducing a new autobalance system for Casual Matches and community servers that asks for volunteers to switch sides. Casual matches will reward you for switching teams by giving you the chance to earn bonus XP! It wouldn’t be Smissmas without the Spirit of Practically Giving. Look for 20%-75% off selected unlocked cosmetic crates, taunts, and tools in the Mann Co. Store through January 11th, 2017. Not only that, but every player gets a “Stuffing Stuffer” item, which is just a gift box item with a lot of goodies.